Property investing is simple if you know what not to do. Once you know that, the doing becomes much simpler and more successful. 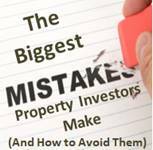 Ian Ugarte talks us through a simple acronym “M.I.S.T.A.K.E” that shows 7 of the biggest mistakes that property investors make.